Whether it’s been 10 years, 20 years or 50 years, high school reunions are a time to catch up with old friends and reminisce about days gone by. Planning a school reunion can be a daunting task but the ideas shared in this article written by Sally Fain gives many helpful suggestions to help you start planning and soon you’ll find yourself catching up with bygone friends. If you’re curious about what happened to all your old school friends, who married who, what jobs they’re doing now and how many of you have kids, why not find out by having a school reunion party? The first thing you need to do when planning the perfect reunion is find all your old friends. As more than one billion people worldwide have a Facebook account. If your friends have identified what school they attended in the education section of their profile, you may be able to find them that way as Facebook can link you with others who attended your school. You can also search by name and surname but this is more difficult as people get married and change their names and some choose a nickname for their account. You do have the option of posting a request for your friends to get in touch with you via the site and for a very small advertising fee, you can ‘boost’ your post so that it is highlighted and appears on Facebook’s News feed. This will attract more attention to it. You can also try Gradfinder, an entirely free search engine that allows you to search for your school and covers all states. If you don’t know the contact details of your school, you could try the American School Directory – an extensive nationwide directory that provides fax numbers, phone numbers, addresses and other details for all public, private and catholic schools. Once you have located the school you can ask if a reunion request can be published on their website. Once you’ve found your friends form your reunion committee. Planning things out will be less stressful and more manageable with help! Some of your friends may have to travel from other countries so you should pick a location that is nearer for the majority. It should also be near a hotel so that those travelling long distances have somewhere to stay overnight. If some of your friends are paying a lot for fuel airline tickets in order to attend the reunion, don’t hire out an expensive venue which would then require you to sell expensive tickets. This will reduce the turn out for your event. For more affordable venues, ask about hiring your church hall or community center. Another great idea to is ask your old school authority if you can hold your reunion at the school that you all went to. Not only will it add to the charm of your reunion, but the money you spend on hiring the school hall will be given to the school to benefit its current students. Its other advantage is that school accommodation is usually large so it shouldn’t be a problem if your mates bring their husbands, wives and children with them. Don’t pay for everything up front as you may get people dropping out. Attendance should be by invitation only, where guests who wish to come send a ticket fee with their invitation slip (or for ease and speed, you could set up a function via facebook and paypal and have them send their acceptance and ticket fee online). If you don’t want to individually charge for tickets, you could try fundraising by appealing on social media or setting up a GoFundMe page. Discuss with your friends the theme you would like for your get together. If you want to give your party a high school theme you could specify that guests come in fancy dress. Costume hire stores and ebay sell school uniform costumes, graduation hats and gowns and other accessories. You can ask guests to email copies of high school photographs that you can then use to decorate the walls with. Another idea is to play music from the year you graduated or theme your event around the music and media from that year. Consider playing group games after dinner to get everyone involved and talking to each other. 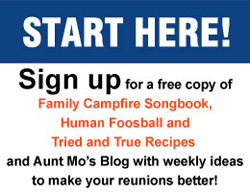 Family Reunion Helper can provide downloadable print outs for group games. Print outs contain instructions for games, patterns for game accessories and themed ideas. You could give parting goodie bags with small items from your graduating school year, for instance, a coin from the year, small fashion items or chocolate. Remember the Place Tags – Put named place holders at the table where you eat or, if it’s a buffet, ask everyone to wear name tags. Everyone will have changed a lot since they were 18! Have a slide show or one comprising home video footage of everyone when they were younger and give everyone the opportunity to say what they’re doing now. Revisit the “good old days” by showing pictures of memorable high school moments. Give Everyone a Throw Away Camera so they can take their own unique snapshots of the event from their perspective. Alternatively, make your own reunion website and ask guests to take pictures on their cell phones and download them to the site so everyone can share their snaps afterwards.